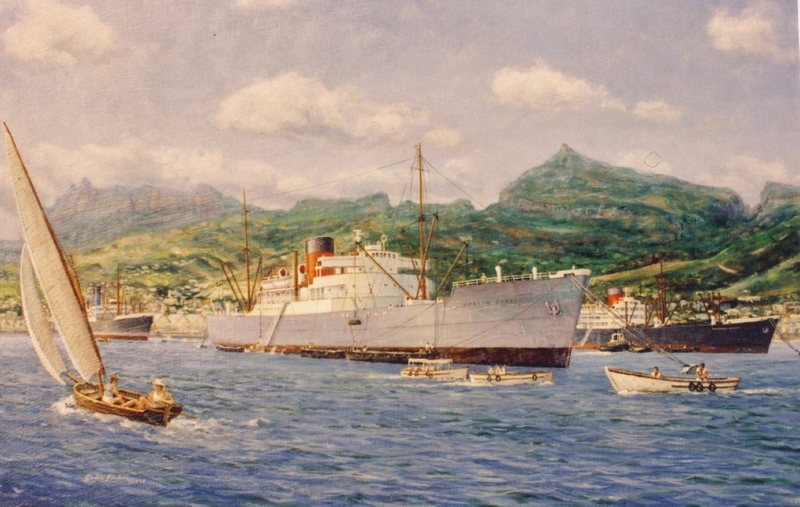 It may be worth noting , that in 1957 because of the "Asian Flu" epidemic across the world MV Roslin Castle when homeward bound from the Cape called at St Helena and Ascension Island with mails and stores in place of one of the Intermediate Passenger Vessels in an effort to limit the spread of the disease which if it had spread to St Helena would have caused havoc amongst the islanders There was no physical contact between the ships crew and the islanders, everybody wore facemasks on the ship and on the barge alongside. Geordie Anson of blessed memory was Captain of "Roslin Castle" Reg Kelso could well have been Chief Officer at that time. A ship I remember with great affection. She was my first ship as a certificated officer. 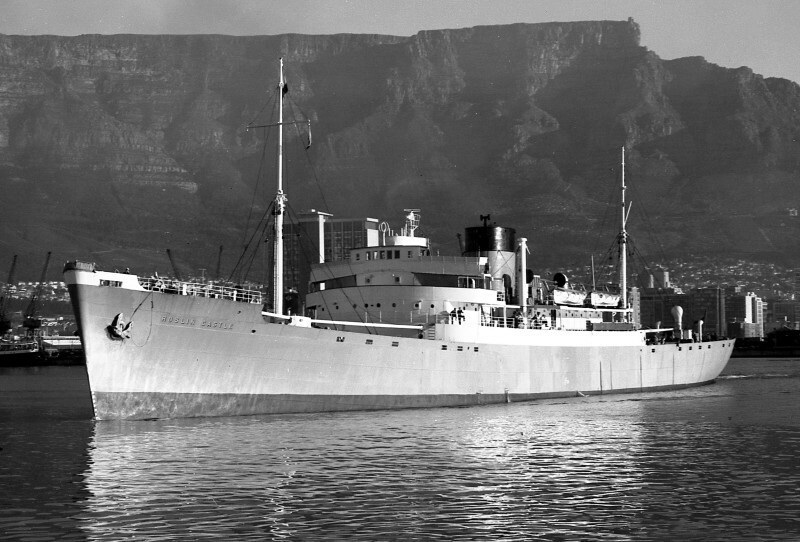 I joined her in 1967 in South Shields just as she was ready to sail for The Cape at the start of the fruit season. My first watch was just after we had dropped the Tyne pilot. The master was Capt. Harold Charnley with whom I had sailed previously when I was a cadet on Constance Bowater. I relieved Ken Purnell, the chief officer, and started my 8-12 watch. At about 2015 Capt Charnley arrived on the bridge. “This is your first watch” he stated, something I was well aware off! “Call me if you need me” and he left the bridge. Whilst I am sure he spent the next four hours with his head out of his day room porthole, I was always grateful for his trust. I subsequently sailed with him on Pendennis and Windsor Castles then as Senior Second Officer. We developed a leak in the propeller stern gland which necessitated a diversion to Singapore where we anchored off, flooded the fore tanks to raise the stern and had divers out to repack the gland. This was achieved successfully. Later, in the South China sea at about 11:00pm one night we were struck by lightening. There were a couple of crew members swimming in a make shift sea water pool on the boat deck behind the Bridge. The lightening hit the mast and travelled very slowly downwards. The crew members jumped out of the pool and ran towards the safety of the accommodation chased by the lightening. It was the first and only time I'd seen this and was amazed how slowly the lightening travelled! We spent three days aboard in the scrap yard in the South part of the Island - the ship was merely 'run aground' between two other ships [it was fascinating and very eerie to take a torch and look around the adjacent ships - we were adjacent to a German Passenger ship - before being transferred [by aircraft - Dart Herald] to Taipei. On arrival we were told that the aircraft chartered to take us home [a Britannia from Lloyd International Airways] had been grounded in South Korea as faulty. We spent two nights in a hotel before being taken to the airport where we boarded the flight [now passed as fit to fly!]. The chartered flight was shared with about 60 Korean student nurses enroute to Cologne to start their training. They were at the front of the 'plane [being violently sick throughout the extended flight] and we were at the back. I sat next to the skipper with two chronometers [Union-Castle didn't include them in the sale] and had the responsibility of winding them [can't remember why the 2nd Officer didn't]. The Capt and I had a lengthy visit to the cockpit where we were amazed to find that the Britannia had a sky dome to enable sextant angles to be taken. [how things have changed]. Not sure how long the flight lasted but it seemed an eternity. Stansted was closed because of bad weather and this necessitated a night in a lovely hotel in Cologne with the air crew and fellow officers [the crew were taken to another hotel]. ROSLIN CASTLE (3) was built in 1935 by Harland & Wolff at Belfast with a tonnage of 7016grt, a length of 443ft 6in, a beam of 61ft 4in and a service speed of 16 knots. 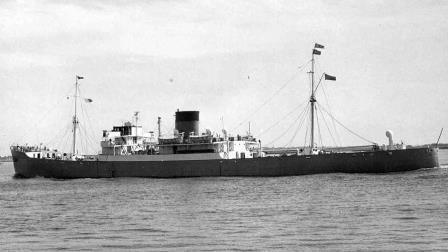 Launched on 20th December 1934 she was given a lavender hull instead of the usual black for a cargo ship. She was completely refrigerated and designed to carry different types of South African produce in different compartments. Although, with her sister the Rothesay Castle, she was often laid up in the River Blackwater between fruit seasons she was still profitable. 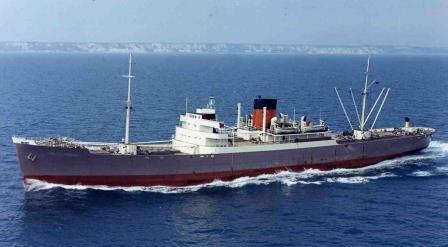 In 1967, the oldest ship in the British & Commonwealth fleet, she was sold for breaking up and arrived in Kaohsuing in Taiwan on 3rd December of that year.